105' Bolero Sailing Yacht is currently completing a comprehensive refit and available in the Mediterranean this summer. BOLERO accommodates 8 guests in 1 king and 3 queen staterooms plus 5 crew. Attractive introductory charter rate of $42,500 low season and $45,000 high season plus all expenses. Whether relaxing with the family aboard in a secluded anchorage or beating up to the windward mark at Antigua Classics, Bolero has everything one would need and expect from a modern classic. 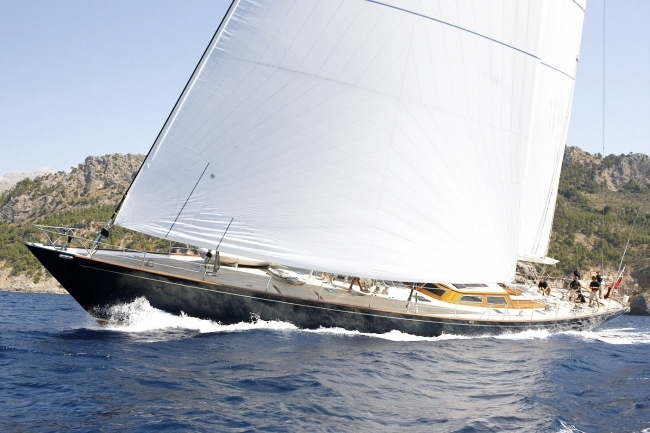 For the first time in her career Bolero is now available for charter. Coming from the drawing board of the famous German Frers, her sleek classic lines and uncompromising performance make her a real head-turner and a true joy to sail. She sports new North Marathon 3DL sails and has a well earned reputation as a sailing power house. Her twin cockpit layout allows for the non sailors to relax in the safety and comfort of the forward cockpit while those wanting to be part of the action can drive from behind the 6' Whitbread style wheel to the aft. Descending the sweeping companionway staircase into the open plan 22ft wide saloon you are whisked back in to a bygone era. Surrounded by antique oil paintings hanging from the walls, classic leather chairs and cherry joinery it is the ultimate place to relax for an evening. Not all is classic, however, with air conditioning in every cabin, 50 inch flat screen TV in the saloon and Bose sound systems throughout, you are not left wanting for the comforts of home.